Did you know that baby turtles are born all alone on the beach? Learn about the life cycle of a turtle with this life science worksheet. Your child will learn a bit about reptiles, and then she'll cut and paste the turtle's stages of life in order. Learn about the life cycle of an amphibian with this diagram of the life of a frog! All living things have a life cycle. Learn about the different stages that a bird goes through from birth to adulthood! Your child can learn about the life cycle of a kangaroo, and how marsupials differ from mammals. Mammals come in all shapes and sizes - as big as a human or as small as a mouse! 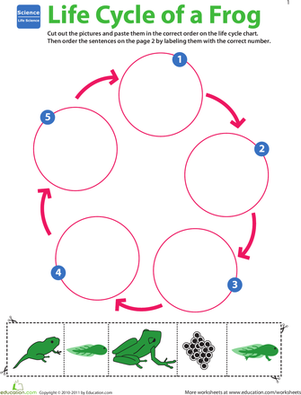 Learn about the life cycle of a mouse with this cut and paste activity.